Crabtree & Evelyn has humble origins as a small, family-run business, but has become an award-winning international brand with over five hundred stores across the globe. With luxury products of such high-quality, it’s not hard to see why they’ve earnt such universal acclaim. Their mission statement is to create sumptuous goods from all-natural ingredients, and has obviously struck a chord, as customers from Kingston-upon-Thames to Kuala Lumpur sing the praises of Crabtree & Evelyn. With a product from Crabtree & Evelyn you are guaranteed quality and style. You won’t be able to keep your hands off their great hand-care range, with wonderful washes, soaps creams and nail products. For a sensational soak in the tub, try their Goatmilk Bath Milk or their Jojoba Oil Bath Oil. If you’ve got a sweet tooth, indulge it with some of their incredible English Butter Toffee or their scrumptious Salted Caramel Fudge. Whatever you treat yourself to from Crabtree & Evelyn, you can be assured it will put a smile on your face. How do I use my Crabtree and Evelyn discount code? Join Crabtree & Evelyn’s email mailing list to receive great news, deals and offers. Do Crabtree & Evelyn test their products on animals? Crabtree & Evelyn are strongly opposed to animal testing. Their products never have been and never will be tested on animals. Are Crabtree & Evelyn products suitable for vegans and vegetarians? Some Crabtree & Evelyn products are made with beeswax, honey, or milk by-products. All the ingredients are listed on the product page and on the label, so check to make sure. Can Crabtree & Evelyn give me any gift ideas? Take a look at the gifts section of their website, for inspiration for birthday, mother’s day, father’s day, anniversaries and more. Crabtree & Evelyn offer a huge range of delivery options. See here for more details. Crabtree & Evelyn accept returns on all items returned in good condition within 28 days of delivery. For the very finest fragrances and the most sensational soaps, look no further than Crabtree & Evelyn. With more than 40 years in the business, honing and perfecting their products, Crabtree & Evelyn have become the world’s favourite supplier of luxury bath and body products. 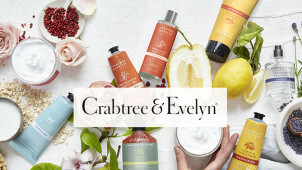 Use a Crabtree and Evelyn discount code to save a pretty penny when treating yourself to one of their wonderful gifts. What’s more, everything in their incredible range is made with all-natural ingredients, so you’ve no excuse not to treat yourself. How do I use my Crabtree & Evelyn discount code? Founder Cyrus Harvey founded Crabtree & Evelyn inspired by the British crab-apple tree, and by the work of 17th-century English writer John Evelyn, a renowned conservationist and environmentalist. His love of the natural world and his motto, “Explore everything, keeps the best” has been rudimental to Crabtree & Evelyn’s work. The crab-apple tree is considered the common ancestor of all cultivated apple trees, and a fine example of Britain’s glorious native flora. On top of supplying the world with gorgeous, award-winning soaps, perfumes and toiletries, Crabtree & Evelyn stocks a fantastic range of foods, inspired by Britain’s rich traditions. Use a Crabtree and Evelyn voucher code to transform your toast with one of their delicious organic jams, curds or preserves. Or why not treat your tastebuds to one of their tantalising teas? Whether you fancy peppermint and liquorice, spiced chai, or just good old-fashioned English Breakfast, Crabtree & Evelyn has what you need for the perfect cuppa, so pop the kettle on.